The magic of the voice with many hints for beginners. For nearly the whole period of the present war I have lectured to and entertained many tens of thousands of members of H.M. Forces—men and women—in Camps, Sites and Barracks of every type, including Military Hospitals, Institutions and a multitude of children. 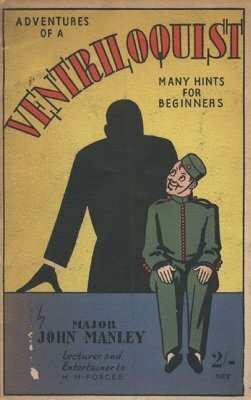 It is at the repeated requests of these men and women in the Forces that I am writing this little book of my ventriloquial experiences collected over a lifetime, and I am hopeful that it will act as a tonic and give encouragement to all who may be attracted by this interesting and amusing Art. During my long and varied career I have always found time to place my amateur ventriloquial services at the disposal of all with but little reservation. So long as I bring a glow to the minds and faces of my audiences I feel that I am amply repaid. In these refreshing interludes the cares and worries of the day appear to vanish from the thoughts of those who share with me a healthy sense of humour. I Join "The Press Gang"
1st edition 1941, 32 pages; PDF 36 pages.